Ilocos Norte Gov. 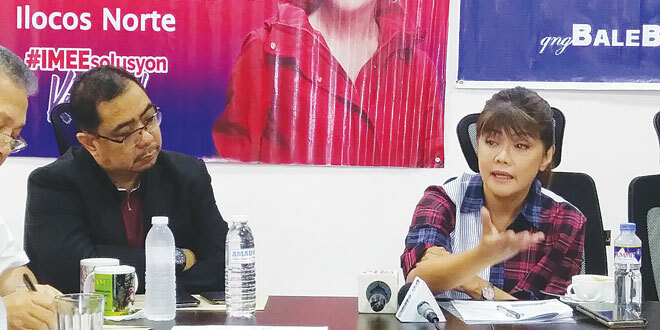 Imee Marcos underscores the importance of boosting the agriculture sector to alleviate poverty incidence in far-flung provinces during the weekly Capampangan in Media, Inc. (CAMI) Balitaan Forum in Clark, Pampanga on Friday. Ilocos Norte Gov. Imee Marcos proposed a three-pronged rescue package for farmers in the coconut industry where at least 3.5 million coconut farmers are suffering from a continuous slump in domestic price for copra, with some barely surviving as they are already buried deep in debt and others no longer harvesting their crops due to low prices. Gov. Marcos visited copra-producing provinces in Eastern Visayas and the Caraga Region in recent weeks and spoke to some copra producers and coconut farmers who relayed to her their dire situation. “Our coconut industry continues to suffer because of the supply glut in the global market. What makes this worse is that the slump is happening during the peak of the harvest season, which is from June to October,” said Marcos, who is running for senator in next year’s midterm polls. Data from the Philippine Coconut Authority showed that the average farm-gate price for copra remained at P18 to P22 a kilo in October. Farm-gate price in Eastern Visayas was the lowest among the copra-producing regions at only P15.62 per kilo last month. This is a significant decline from the average P25 per kilo farm-gate price in the first quarter of the year. “If the trend continues, there will be a 10 percent increase in the poverty incidence in the provincial areas where copra prices continue to drop. What we need is immediate intervention through a rescue package for our coconut farmers,” she added. “No less than President Rodrigo Duterte earlier ordered Landbank of the Philippines and the Development Bank of the Philippines to provide programs that will support small borrowers, particularly our farmers,” she said. “Proceeds from the P75 billion coco-levy fund should also be used to directly benefit poor coconut farmers, especially amid this plunge in prices of copra,” Marcos said. Second, Marcos said the government must crack the whip on copra smugglers who are bleeding local farmers dry. “We should unmask these smugglers and charge them before the proper courts. We should use the full might of the anti-smuggling law against the unscrupulous people who profit at the expense of our kababayans,” she said. “Let’s not forget that large-scale agricultural smuggling is already considered economic sabotage under the law,” she added. Lastly, Marcos said moving toward a five percent biodiesel blend (B5) from the current two percent will serve as a long-term solution to the problem of plummeting copra prices.